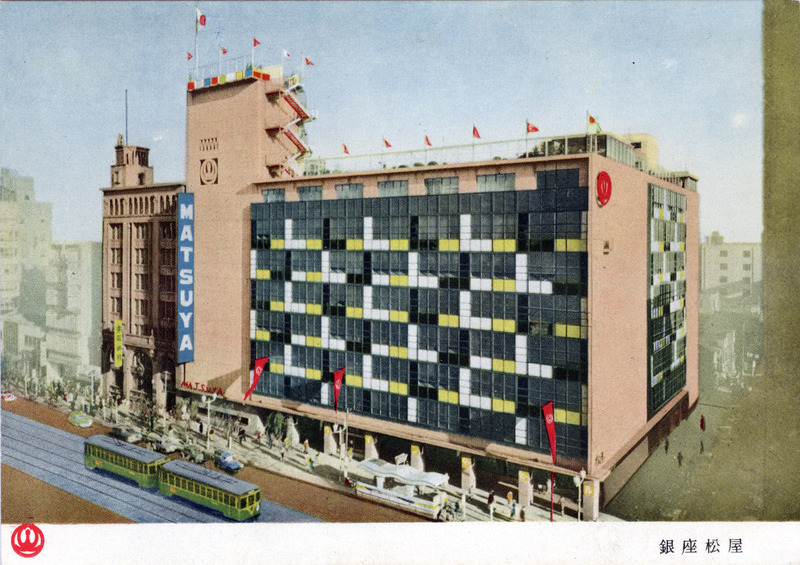 Elevated view of Matsuya department store, c. 1940. 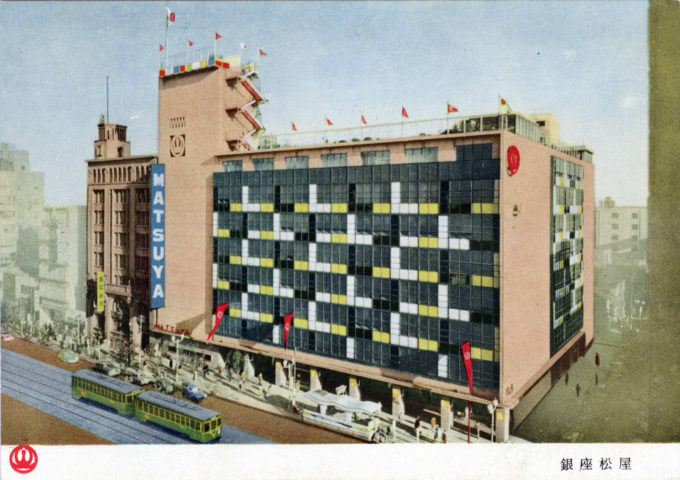 “The department stores located along the stretch between Nihonbashi and the Ginza attracted people from both near and far, and their very presence contributed to the hub of activity and crowds of people. What really contributed to the area’s popularity, however, was the decision by Matsuzakaya to set up a Ginza branch in 1924, and by Matsuya in 1925. 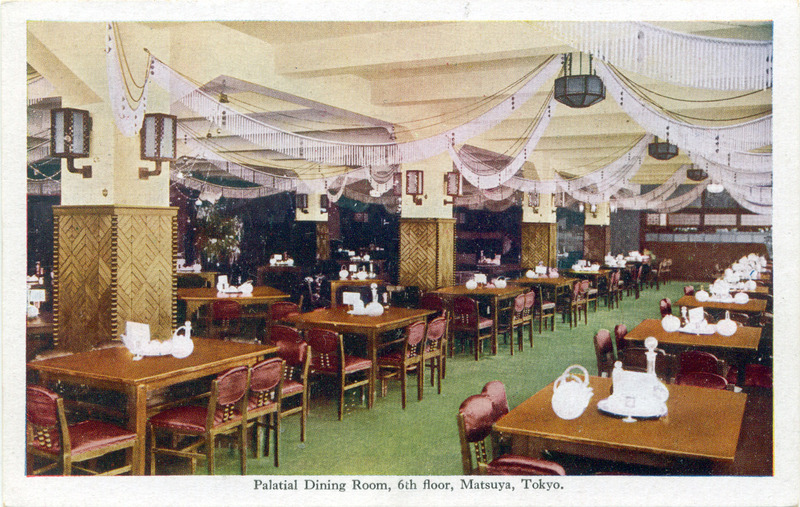 Interior view, Matsuya department store dining room, c. 1940. 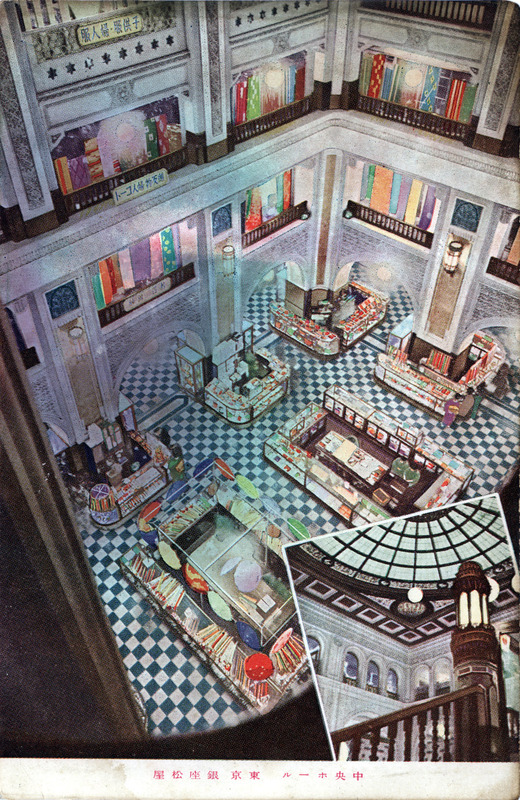 Matsuya department store, Ginza, c. 1935. 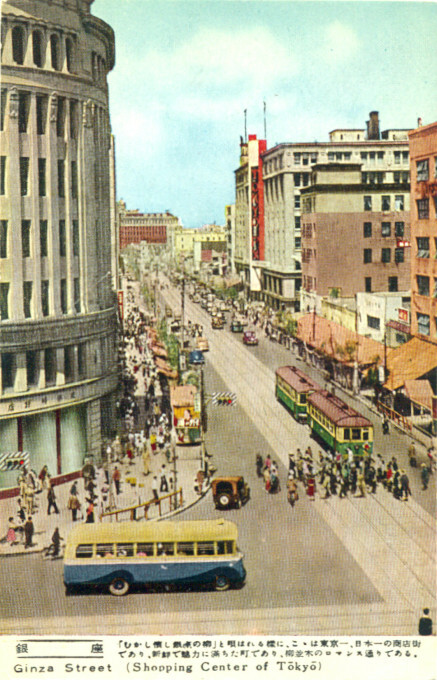 Aerial view of Ginza Crossing, c. 1940. 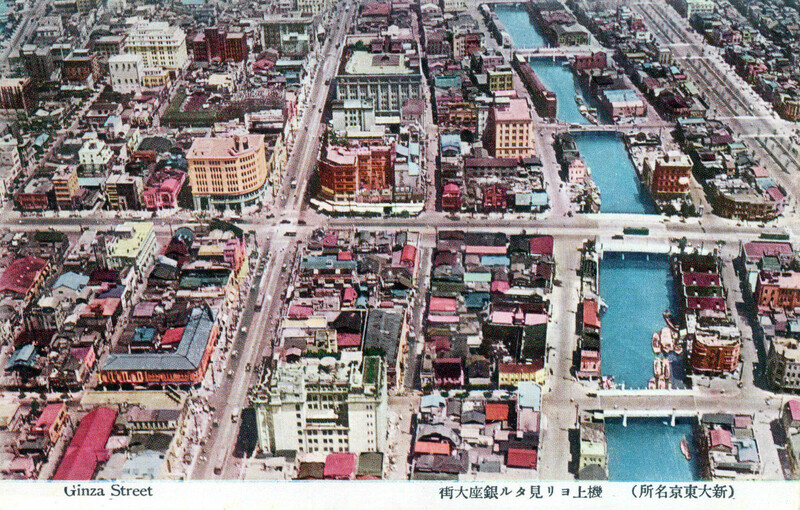 The Wako (Hattori) clock tower is left of center; Matsuya department store is at top center; Matsuzakaya department is at bottom center. Matsuya & Co. was founded in 1869. 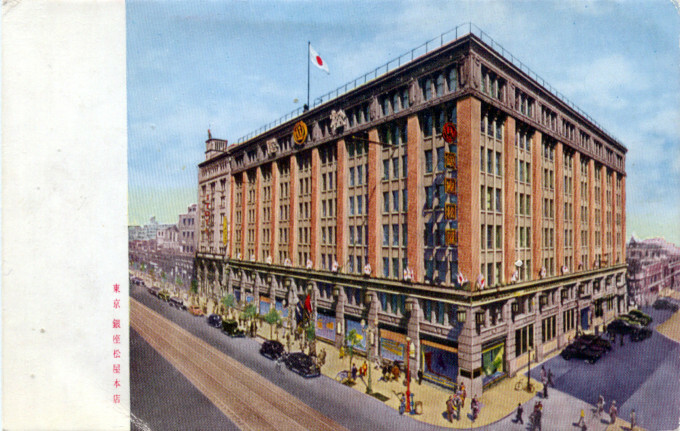 The company opened its first Tokyo department store near Ginza Crossing in 1925, and opened its branch store at Asakusa in 1930. Central Hall, Matsuya Ginza department store, c. 1930. 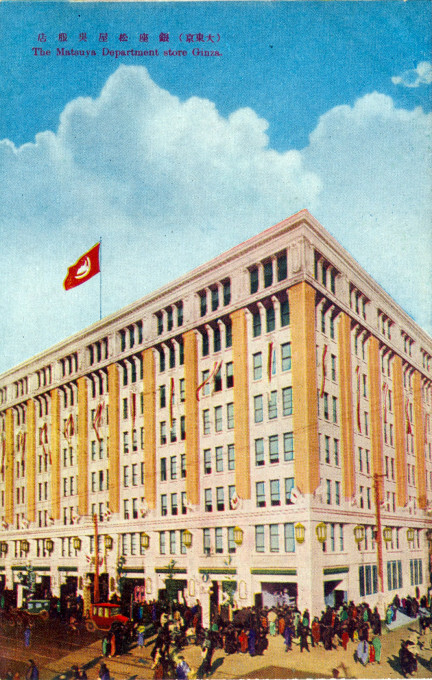 Matsuya department store, c. 1930. Ginza Crossing, c. 1950, looking toward Kyobashi. 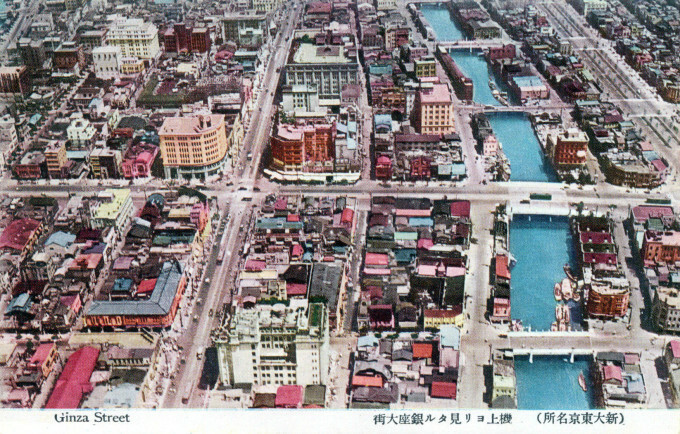 At top-right is the Matsuya department store. The vertical red sign reads “Tokyo PX”. 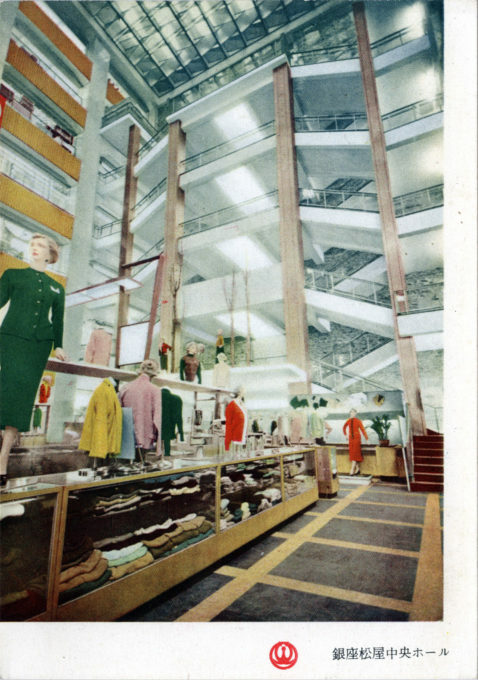 Interior of Matsuya department store, Ginza, c. 1965, after its remodeling. MacVeagh’s hope for the future would go unrealized. War would break out in 1941 between Japan and the United States, resulting in Japan’s surrender and occupation four years later. The Ginza store would be heavily damaged by firebombing but quickly repaired in the conflict’s immediate aftermath. Subsequently, during the Occupation period after the war (1945-1952), Matsuya Ginza would become of the two main Tokyo PX (Post Exchanges) for Allied troops stationed in the capital and then become, during Japan’s post-war “economic miracle”, one of Tokyo’s most glamorous department stores. 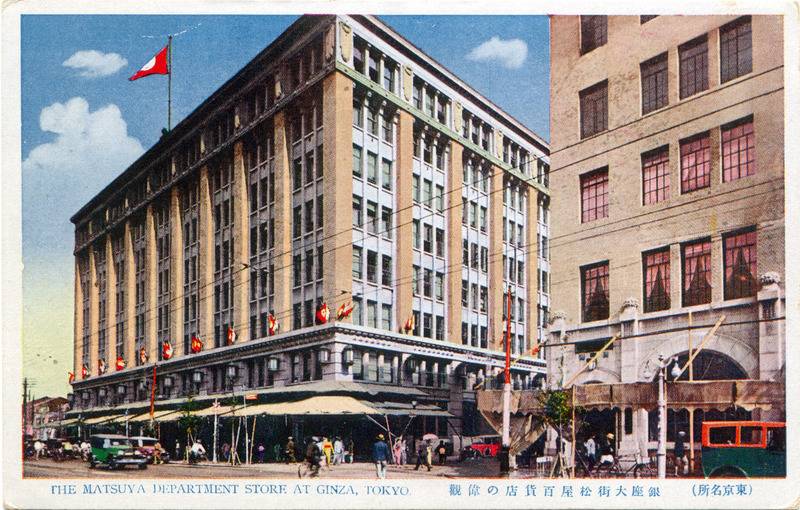 The Ginza flagship branch was extensively remodeled in 1964, in time for increased tourist traffic brought by the Tokyo Summer Olympiad. Matsuya department store, Ginza, c. 1965, after an extensive exterior make-over.